Serve these fabulous shrimp cakes as an entree or make them small and serve as an appetizer. They could be served in sandwiches as well. Your friends and family will love them! Simple seasonings enhance the flavor of the shrimp, and an egg and some mayonnaise help hold the mixture together. We used Old Bay seasoning, black pepper, and a bit of garlic powder. Feel free to add some cayenne pepper for heat, or use a seasoned salt blend instead of Old Bay. 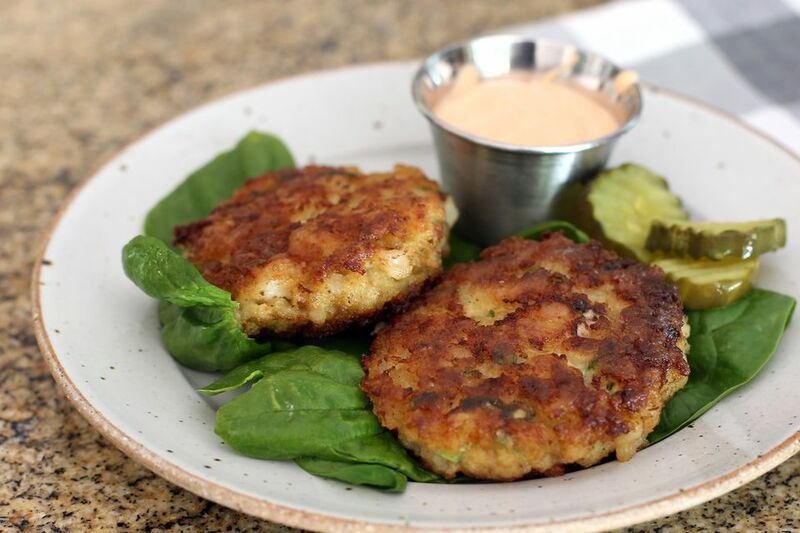 The Sriracha mayonnaise blend makes a quick and tasty sauce for the shrimp cakes, but a homemade tartar sauce, chipotle mayo, or remoulade sauce would be excellent. Peel and devein* the shrimp and then rinse under cold running water. Chop the shrimp finely and transfer them to a large bowl. Add the panko breadcrumbs, green onions, Old Bay, garlic powder and freshly ground black pepper. Toss to blend the ingredients thoroughly. Stir in the mayonnaise, lemon juice, and the beaten egg. Mix well. Line a pan or tray with wax paper or parchment paper. Shape the shrimp mixture into patties about 1/2-inch to 3/4-inch thick. Place the shaped shrimp cakes on the pan; cover and refrigerate for 30 minutes. Heat the warming drawer or oven to 200 F if you are cooking in advance or batches. Lightly dust the shrimp cakes on both sides with the flour. Handle gently to keep them from falling apart. Heat the olive oil and butter in a large skillet over medium heat. Cook the shrimp cakes in the hot fat in batches, for about 3 minutes per side. Let the patties brown thoroughly on one side before carefully turning to brown the other side. Serve immediately with the Sriracha mayonnaise or transfer the cooked shrimp cakes to the warming drawer or oven to keep warm for up to 20 minutes. Combine the 1/2 cup of mayonnaise with Sriracha sauce; blend thoroughly. Cover and refrigerate until serving time. Makes about 4 entree servings or 6 to 8 appetizer servings. *To devein, run a small, sharp knife down the back of a peeled shrimp, pull or scrape the dark vein out.